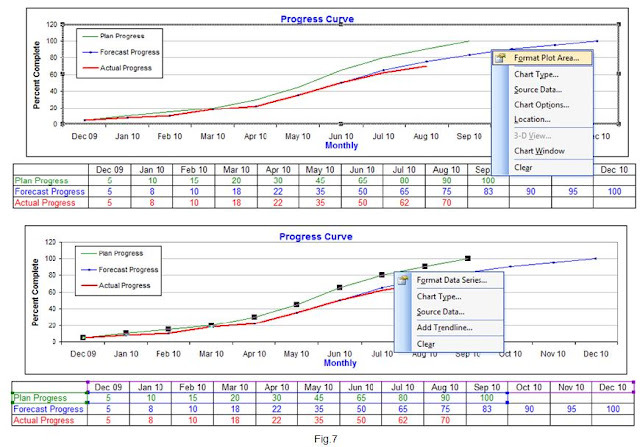 Progress S curve can be easily created in excel 2003. It is normally used for graphical presentation of accumulation data. For example, weekly or monthly progress of engineering drawings and documents, production of sheet metal plates, construction of pipe rack and so on. 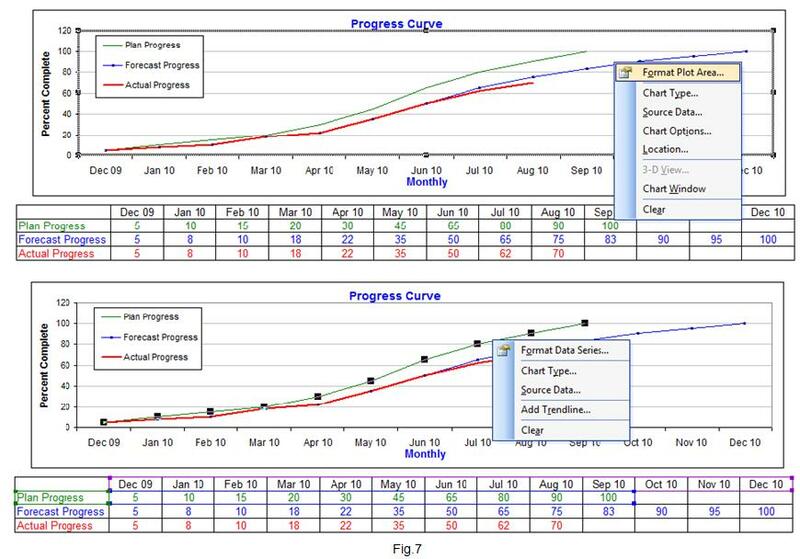 Suppose the monthly plan progress, forecast progress and actual progress are available as shown in Fig-1. 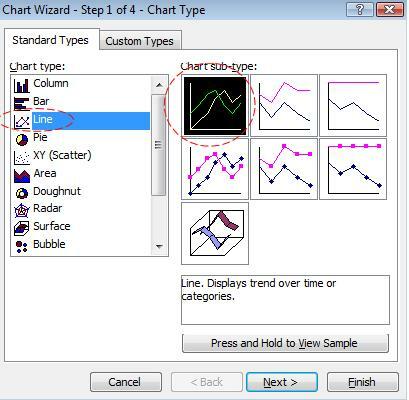 (1) Click the chart wizard menu on the standard tool bar ,,"Chart Wizard-Step 1 of 4-Chart Type" window will be appeared and select standard line and chart type, and click "Next" as shown in Fig.2 . 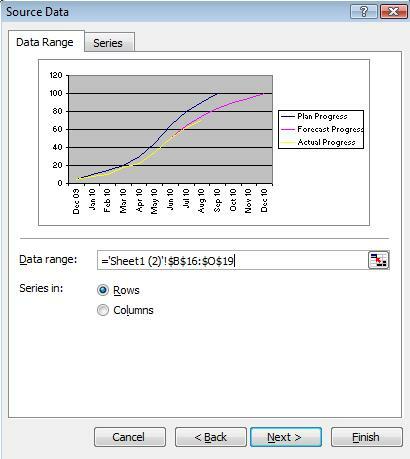 (2 ) "Chart Wizard-Step 2 of 4-Chart Source Data" window box appears and click data range on the data range tag as shown in Fig.3. 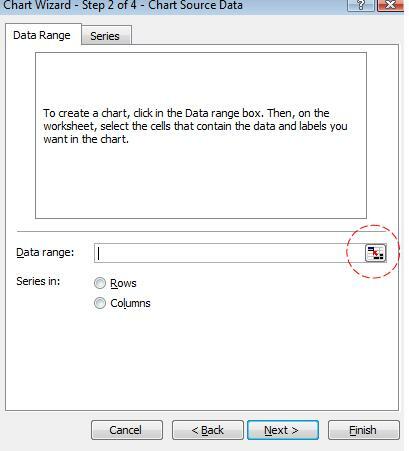 Source Data-Data range box appears for you to select the designated data. 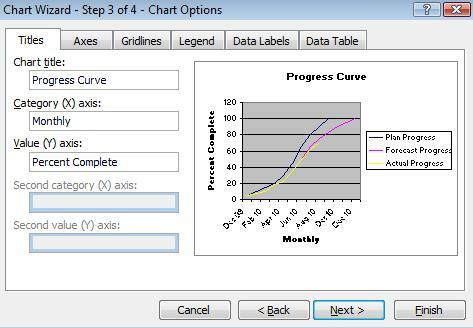 (3) Select the progress data as shown in Fig-4, you would see Chart Source Data window and click "Next" (Fig-5). It's simplest way to explain the S curve. Very helpful for learners. Good Article but what I find most challenging is coming up with the %completion of a project cumulative and arriving at actuals and forecast. Lot of ratios !